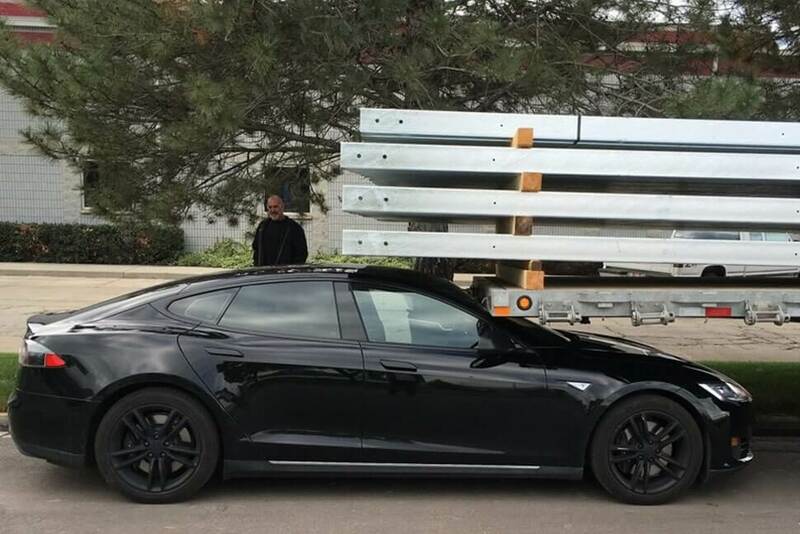 A Tesla customer in Utah claims his Model S vehicle started itself and drove into / wedged itself under the back of a parked flatbed semi-trailer. The accident, which took place on April 29, occurred shortly after Jared Overton parked his Model S on the side of the road. An employee at a business he was visiting while running errands asked him a handful of questions about the electric vehicle before the two walked inside the business. When Overton returned five minutes later, he found the Model S wedged under the back of the semi-trailer. The owner told Salt Lake City TV station KSL that he couldn’t figure out how the vehicle managed to start on its own and pull forward into the trailer. After reporting the incident to Tesla, however, it appears as though his story doesn’t exactly add up. The vehicle logs confirm that the automatic Summon feature was initiated by a double-press of the gear selector stalk button, shifting from Drive to Park and requesting Summon activation. The driver was alerted of the Summon activation with an audible chime and a pop-up message on the center touchscreen display. At this time, the driver had the opportunity to cancel the action by pressing CANCEL on the center touchscreen display; however, the CANCEL button was not clicked by the driver. In the next second, the brake pedal was released and two seconds later, the driver exited the vehicle. Three seconds after that, the driver's door was closed, and another three seconds later, Summon activated pursuant to the driver's double-press activation request. Approximately five minutes, sixteen seconds after Summon activated, the vehicle's driver's-side front door was opened again. The vehicle's behavior was the result of the driver's own actions and as you were informed through multiple sources regarding the Summon feature, the driver is always responsible for the safe operation and for maintaining proper control of the vehicle. Data from the Model S log paints an entirely different picture of the incident and as the publication notes, both parties have every reason to shift responsibility to the other party. Tesla even states that its vehicle may not detect certain obstacles including those that are very narrow (like a bike), those that are lower than the fascia or objects hanging from a ceiling. While the Summon feature does allow owners to park their vehicle without having to be in it, Tesla says drivers should continuously monitor the vehicle’s movement and its surroundings at all times. Furthermore, Tesla implores the feature should only be used on private property. Tesla revised its Summon feature earlier this year, adding additional layers of safety that make it much more difficult to accidentally activate it. Now, its use is limited to a smartphone app in which owners must keep their finger on the screen for the feature to work. Removing the finger from the onscreen button will stop the car. Furthermore, the keyfob can now only be used to stop the vehicle, not drive it. That said, the accident highlights the continued need for additional research and development in the autonomous driving sector. Overton told KSL that Tesla can tell him what they want to tell him with the logs but that doesn’t change what he and another witness know happened. So, who do you believe? Was Overton trying to pull a fast one on Tesla and get them to repair the vehicle for free? Did Tesla fabricate the log data so its vehicle wouldn’t seem liable? Is the truth somewhere in the middle? Let us know what you think in the comments section below.